Well, I apparently missed any WWKIP events in my area on 6/13-14, however I did manage to knit a few rounds of a sock at SB while sipping a mocha that Saturday ... at VF Mall when DH had to stop by the FruityComputerStore to talk someone at the Genius Bar about a MB battery not holding a charge. This is the 2nd replacement battery under the FruityCare Plan. If this replacement is bad and we have to get a 3rd replacement, then the FCP will have paid for itself. I inherited 7(?) 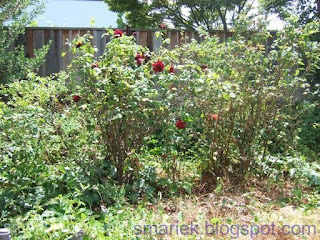 rose bushes with the house and have left them alone for the past year and a half. 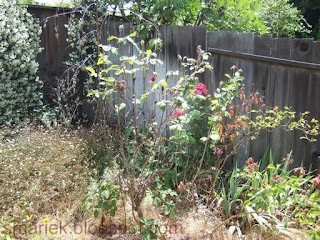 They seemed to thrive with neglect, blooming often on their own, although they look big/bushy/wild now mingled in with a multitude of weeds. 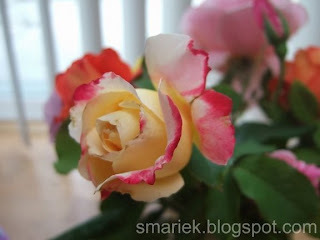 It took this long before I discovered that I could have fresh roses inside my house. I picked a few and found a plain vase to put them in, then set them on my kitchen counter. They bloomed over the next few days and then I replaced most of them with a few more from the garden. I took these photos the day after the 2nd picking. (At least) Two of the roses were from the 1st picking (5 days before) and the rest are from the day before. I have no idea what type of roses I have. I couldn't find a website showing photos & rose names. I suppose there would be too many varieties to be able to identify what mine are. I tried reading up on pruning and find it very confusing with all the conflicting info. 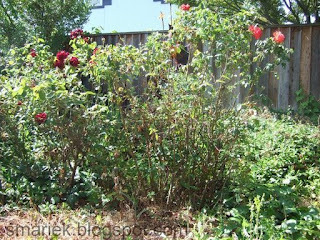 I discovered that what I'm doing isn't really pruning, but more accurately called dead heading. I'm just cutting/pinching/snapping the dead/dried part of the stem underneath the spent flower ... it's definitely closer to the peduncle than hacking off half the plant. I read something about cutting back down to the 5-leaflet. I'm not sure how that works because there isn't always a section with 5 leaves. ??? 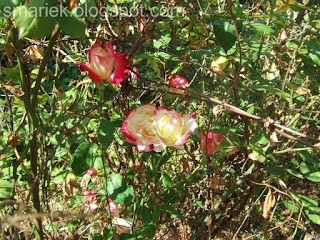 After a bit of reading, I discovered that the "stick with pom pom" looking roses which Cynthia mentioned are called tree roses. These are the ones I see outside my neighbours' houses. The light pink and light purple ones are from 5 days before. I think they'll last one or two more days in the vase. 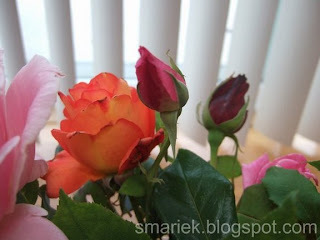 These two close bud roses (pink & red ones from 1st photo of the 2) should open up in the next few days. The red one is the most uninteresting out of the bunch. I think it is because it most resembles the typical store bought rose, however mine is infinitely more fragrant than any store rose. I wish I could convey scent in a blog post. 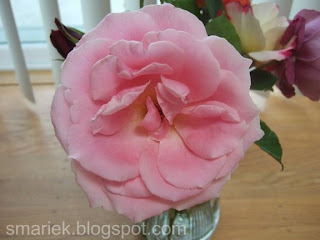 This is one of my favourites, this light white/yellow rose with a bit of pink around the edges. It also seems to be one of the more fragrant ones. This orange one is another fave. I think it's neat how the petal edges aren't just simply smooth/rounded. 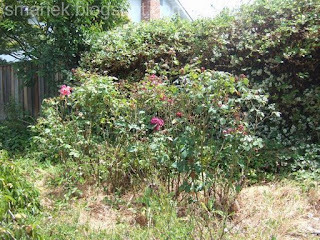 There are 2 bushes here and they don't seem to thrive as well as the bushes on the east side of the yard. No idea why. It's pretty dead here now, just branches. There might be a few flowers now and then. Here's the next set, 2 bushes. Sometimes it is hard to tell where one bush ends and another begins. But there are definitely 3 different colors in this bunch, so I'm gonna say there are 3 bushes here. I think these are pink, light white/yellow with pink edge, and yellow. 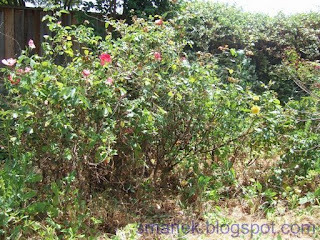 In this grouping, you will find the bush with the white with pink edge flowers. The 2nd photo here shows you a healthy set of these white ones that is nestled in the center of the bush, surrounded by dead or non-flowering woody branches. (I had to push aside some prickly branches - ouch! - to get in close enough to take that pic) It's kinda odd looking to see this bush with brown branches & green leaves, then this nice healthy green branch smack in the middle of all this. 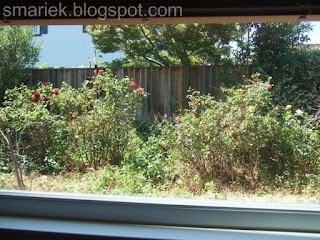 The bushes from these last 2 groups are the ones I see right outside my bedroom window. The bushes are planted in a raised section of the yard. V thinks this was done intentionally so that they can be viewed from the bedroom window. There's a clearer photo here showing just how much higher this raised section is. The orange and red bushes had a few more blooms 8 days later. I have a hard time taking pics of some of these because these bushes are a bit taller than me (I'm 5 ft). Oh, those photos above were taken a week apart, I noted which ones were taken at a later date. Right now I have more blooms on some of these bushes. I guess I should leave a bunch of flowers on the bushes so they don't look so bare. 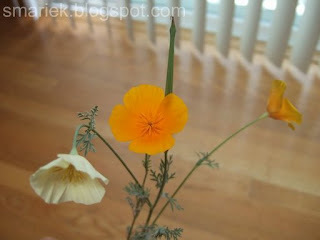 Besides, I do want to have some flowers left for V to pick the next time she visits. Hmm... I wonder if I should not post those pics. It's rather embarrassing. Or perhaps they'll make you feel better about the state of your garden. 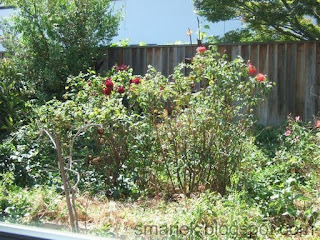 :-) If you want to see a pretty garden, check out Trish's eye candy over here. She takes beautiful photos. These grow freely in a small corner of the yard. 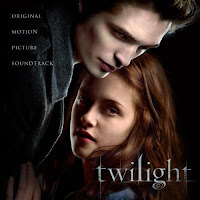 Rita mentioned Twi-inspired yarn. I had no idea they existed! I do not need more yarn. I do not need more yarn. There are a gazillion Twi-interviews out there. 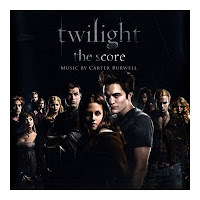 I thought you Twifans might enjoy these old ones ... this MF unscripted interview with SM, KS, & RP (it's about ~10 min long), because it's a little different from the majority of interviews you see out there. After you're done with that one, you'll find a bunch of interviews on EW here (4 with TL, 5 with RP, and some others; use the scrollbar to the right of the vids to see list). Oh and for you guys who are more into photos than interviews, lotsa pics of RP in Cannes here. So where's the knitting? Well, I did make one more earbud (see first 2 pairs here), but can't start on its mate until I get a sock off the pointy sticks. Yeah, I sorta started another sock with those same needles before I started the 2nd earbud. No idea what I was thinking there. 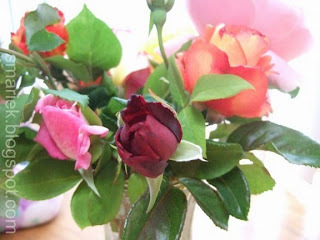 What gorgeous roses! Such beautiful colors. I can identify one of those roses for you!!!! 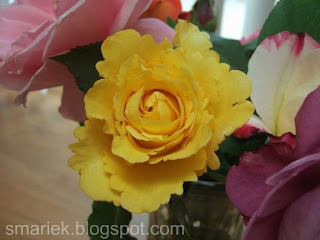 The fragrant one that's a creamy/yellow with a pinkish red tip is called Double Delight. I have a few near my laundry lines, and the smell is so fragrant you can smell it on the laundry! You've got some beauties there! 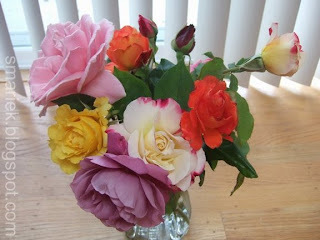 Marie, you have some beauties - and yes, roses are quite forgiving! 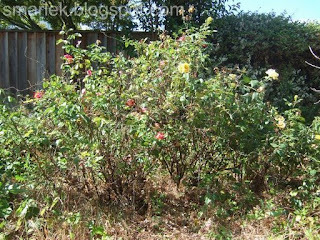 If you do a google search on rose pruning, you'll come across several sites with pictures. Sunset Magazine used to have an on-line tutorial, but I could not find it. 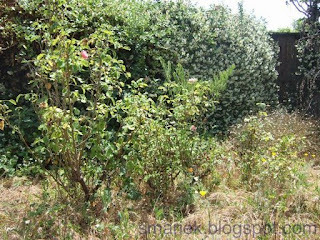 (Of course hard pruning should be done in January in this area; you don't want to stop the blooms now...) Have fun! 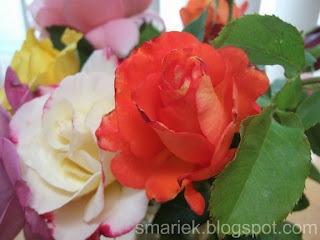 Your Roses must scent the room nicely, I love home grown Roses. 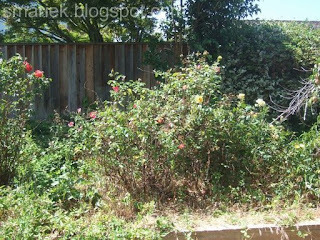 I used to have several bushes at my other place and they thrived with regular water and feeding. I used Dr. Earth and favor natural feed as it does not deplete the soil like miracle grow does. Humate will feed the micro organisms in the soil, which will make it softer, it also encourages earth worms. 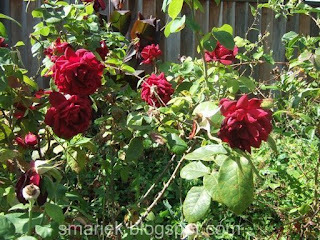 Check at the American Rose Society's home page, Marie. 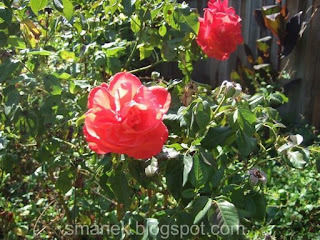 At least look at the "Rose of the Year" photos. I second the vote for Double Delight-it's known for fragrance. 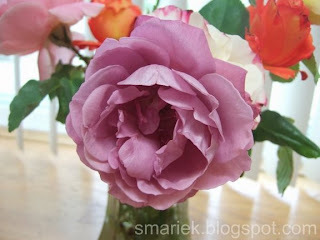 The lavendar one might be a David Austin Rose (a specific breeder). Your roses are absolutely gorgeous!! !